Two years ago I broke my leg during the CCC. This year I returned for revenge! 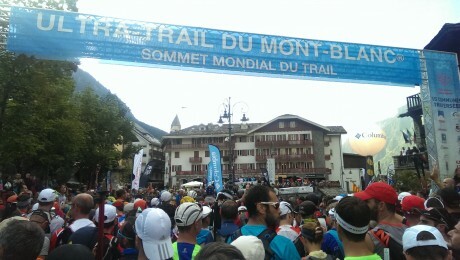 The CCC is part of the Ultra-Trail du Mont-Blanc series of races, the main event being the UTMB, which is part of the Ultra-Trail World Tour. The CCC follows much of the same route as the UTMB, but is shorter at ‘only’ 101km in length. However, the race itself still involves >6,000m ascent and attracts over 2,000 runners each year, and is taken very seriously! Believe me, this race makes the Davos 78k feel like a walk in the park! 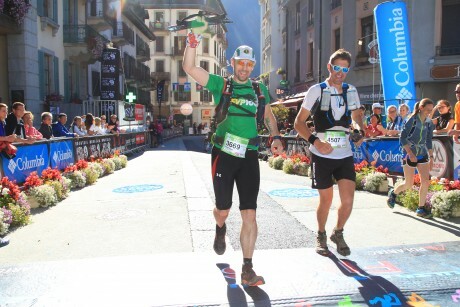 Both the UTMB and CCC attract some of the best trail runners from across the world, and are incredibly popular meaning that the races themselves are oversubscribed year after year. As such, not only do you have to earn points to enter these races, but you also need some luck in the ballot. To enter the CCC in 2016, you now need to acquire a minimum of 3 points by having finished, between 01/01/2014 and 31/12/2015 exclusively, 1 or 2 races from a pre-determined list found on the UTMB website. I had entered the CCC back in 2013 as an inexperienced mountain runner. Paying more attention to the beautiful glacial scenery than the trail, I had tripped on a root and fallen off the mountain path, colliding with a tree. This left me with a fractured fibula and a very painful 10k hobble to the next aid station, where I was subsequently withdrawn from the race by a doctor. I had applied to enter the race again in 2014, but was unsuccessful in the ballot. Fortunately 2015 was to be my year, so it was time to tackle this beast again! I was determined not to look at the glacier this time round, unless I was static with camera in hand. The geographer in me loves the alpine scenery far too much it seems! Training for the race had been less than ideal, although I’d managed to squeeze in quite a few hilly marathons throughout the year, and a few ultras. The race calendar had included the Ashurst Rail to Trail marathon (4th place), the Peddars Way Ultra (4th place), the Mill Hill marathon (4th place), Eco Trail de Paris, Boston marathon, The Pony Express, Comrades marathon, and the Stour Valley Marathon Special (2nd place). I’d also completed Ironman Bolton, a number of runs up a snowy mountain whilst in Zell am See, a run up Lions Head in Cape Town, in addition to a few hill sessions on Hampstead Heath. However, my training had definitely lacked any decent mountain trail running as I had a bad snowboarding injury earlier in the year which had limited my ability to do anything too technical! From the UK, it’s very straightforward to book flights direct to Geneva, where there are regular transfers to Chamonix. I flew via Swissair (mmmm, free Swiss chocolate) and booked my transfer using AlpyBus. 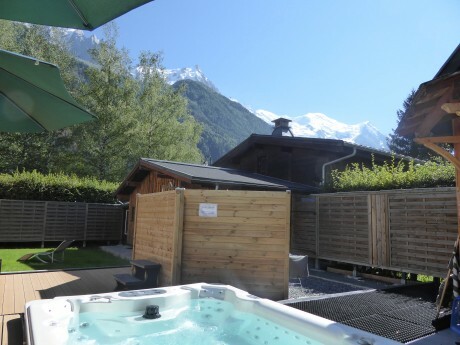 I had also managed to secure accommodation in Chamonix through Airbnb, and had found a lovely ski chalet a short walk from town, which had a sauna and jacuzzi! That’s how I roll! Chamonix is a great place to stay for the race, as there is so much going on in the town during the week. It’s also where the CCC ends, so you can easily crawl back to your accommodation and then watch the UTMB finishers later in the evening. The CCC itself begins in Courmayeur (Italy), and buses are provided by the race organisers to take you to the start. The gun fired at 9am on what was already a warm day. As we set off, I was wearing leggings and a t-shirt, and I didn’t feel remotely cold. The start of the race is brutal, with an ascent from ~1,200m to over 2,500m of altitude, which provides an exceptional panorama, facing the Mont-Blanc and the Grandes Jorasses. The climb feels like it goes on forever, and poles were definitely helpful. I know many Brits dislike the use of poles (calling them ‘cheating sticks’), and I can see that they are not good from an erosion perspective. However, not only were they useful for taking some of the weight off the legs during the ascents, but they saved my skin a couple of times during the race. On one occasion during the night I slipped on the trail, but managed to catch myself with the poles rather than landing on my bum. Also, during the initial ascent, one of the competitors in front of me misplaced his pole. It slipped on a rock and headed straight towards my groin! Fortunately I was able to use my pole to parry this strike, which clearly saved me some discomfort! It’s easy to get injured in the pole fight at the start of the race, so you might as well take poles to defend yourself. After all, would you turn up to a duel without a sword?! The distance between the aid stations throughout the race can be quite considerable, particularly later on in the race. 17km might not sound like much, but when you are travelling at an average pace of 15min per kilometre, it can feel like an awfully long time until you get your water bottles refilled. Due to the heat, it became necessary to take things slowly (I kept on saying the Swahili word ‘polepole‘ during the climbs, which means slowly and gently) and become resourceful. Many runners were taking advantage of the unofficial aid stations set up by locals and the pipes on the mountain that were flowing with fresh water. Taking a drink from one of these icy cold sources was certainly one of the most refreshing things I experienced whilst battling the 20-30 degree temperatures on the mountains, where there was little shade from the glaring sun. Fortunately when you did reach an aid station, they were generally well stocked with snacks and drinks. However, there is definitely an emphasis on self-reliance throughout the race, so it’s essential to be carrying food reserves to keep you going on the long treks between aid stations. 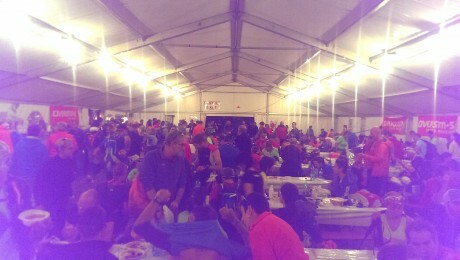 The aid stations themselves were fairly chaotic affairs and reminded me of raves I’d attended in fields when I was a teenager. Runners were sitting around wide eyed, drinking as much fluid as possible whilst trying to work up an appetite, caked in sweat and mud. Supporters were allowed access to help runners, however some of these supports often ended up hindering other runners! I was running low on energy and queued for food at the half way point, where a supporter decided to push in front of me because she had a hungry child with her. Only acceptable if the child is running the race! Still, the volunteers at the aid stations were superb, often helping to top up water bottles, and the selection of snacks and drinks was excellent. It was particularly nice to be able to get hot food at the half way point, particularly as energy levels were dropping at that stage. It was also the first time in my life I’d eaten an orange and a lemon, as I was desperate for some natural sugars and extra refreshment during the heat of the day. 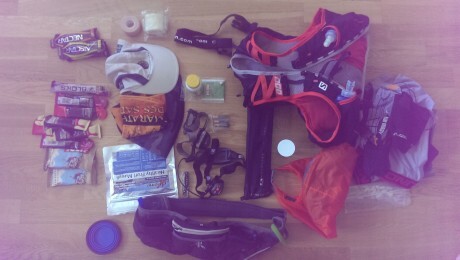 There is quite a large amount of mandatory kit you need to carry with you for the race. Most of the items are very sensible to have, as they are there to either protect the environment or protect you! You are required to carry a couple of head torches, in addition to spare batteries. Only the winners are able to reach Chamonix before dark, and most people will be out on the mountains overnight. I was amazed by the amount of runners I saw resting their eyes by the side of the trails throughout the night. I very much hope their alarms roused them from their slumber in order to finish the race. As one point my eyes became very heavy and I was tempted to have a kip too. I think it was the combination of exhaustion, the heat, low blood sugar levels, and possibly the effect of altitude. I’d also felt very sleepy during my ascent of Kilimanjaro last year, although that was twice the altitude of CCC’s highest point. After gobbling a gel and trekking to the next checkpoint where I downed a couple of cups of Coke, I felt like a new man. I don’t think I’d have the self discipline to cat nap for 20 minutes and carry on racing, but perhaps this is a skill I need to learn. Aside from the poles and the head torch, probably the other most useful piece of equipment was Compeed. I went into the race with a tender foot and this only became worse as the race progressed. On the final descent I misplaced a foot on a rock, and the skin tore. If it were not for Compeed, I genuinely believe I might have had to hop 4 miles downhill to the finish, as I could not put any weight onto the foot prior to applying the second skin. You never feel lonely during the night section of the race as there are always other runners around you, due to the size of the field. 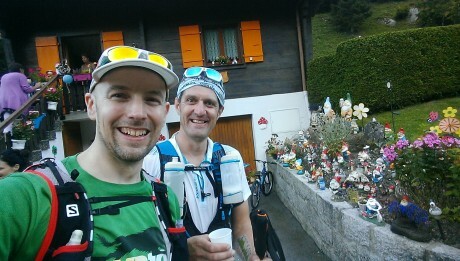 Despite this, I’m always more motivated if I’m buddied up with someone, and on this race I met a friendly Brit called Paul. He found me sitting on a rock having a rest at about mile 15, and then caught up with me again around mile 30. At that point, we decided to tough out the rest of the race together as it was good to have some company and entertaining chat. Having a buddy also helps you through the dark moments when you simply want to quit. We were able to push one another along when either one of us felt low, and it was hugely helpful having someone there who knew the route well. It’s also good having someone to sense check your hallucinations with…are there really supporters over there at the top of the mountain in the middle of the night, or just a herd of cows with bells on their necks? Possibly one of the most memorable moments, apart from the run through town at the finish, was looking up at night and seeing a snake of head torch lights twinkling on the mountain side, rising upward towards the heavens. Despite being beautiful to look at, I decided it was best not to look upward for long, as it could be quite demoralising seeing how far you still had to climb. This was particularly true at night and towards the end of the race, as there were plenty of false summits and the distances between aid stations felt rather distorted. The run into Chamonix was amazing, as you weave through the streets of this beautiful town, past bars and restaurants with crowds lining the route cheering you onward. You only get this royal treatment and rapturous applause if you are one of the earlier or later finishers, as many runners finish in the early hours of the morning when the streets are relatively deserted. At the finish line, you are handed a rather fantastic gilet for your efforts, but sadly there is no medal to acknowledge your accomplishment. Still, I’m sure the gilet will be worn with pride for many years after the event. What did I learn? Well, I leaned how important it is to keep taking on board energy throughout a long distance race. If you can’t eat or hold food down, you are going to be in big trouble! It makes sense to carry a variety of snacks and energy products with you and not to always rely on aid stations. I also learned how important foot care is. If your feet feel uncomfortable, it will alter your running style and will no doubt lead to other issues. Definitely carry plasters and padding with you, and take time to sit down and clear your shoes of stones or twigs. I learned how important it is to have a reward mechanism to motivate you. I carried a small container of Coke during the long climbs and would treat myself to the drink at the summits, something I’d really look forward to. It made such a nice change to consuming energy drinks or water, and the caffeine and sugar definitely helped keep me strong on the descents. Finally I learned that sometimes the adventure is more important than the race. For me, this event was all about completing the distance and conquering the terrain. I was racing nobody but myself and the cut-off times, which was a pleasurable feeling! 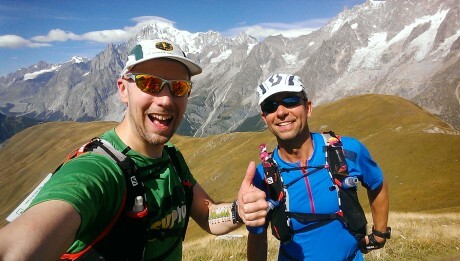 So, the big question, would I run the UTMB after that experience? If you had asked me this question during the race, or shortly after, I would have told you where to go. I literally could not have gone on for more miles after finishing the race, as my feet were battered, blistered, swollen and bruised. However, on reflection, I’d love to at least attempt the longer race, particularly after the learnings taken from the CCC. The CCC is a damn tough race in it’s own right and will break many. This year, only around two thirds of runners completed the course within the cut-off, earning themselves 3 points to put towards entry to the UTMB. Perhaps if I manage to accumulate enough points over the coming months I’ll put my name into the hat, looking for another excuse to visit Chamonix alongside so many other wonderful people. Finally, a big thanks to the organisers and volunteers, in addition to my mate Pip who I started the race with, Paul who I finished the race with, and the rest of the ultra running community out there. In particular the Run247 and LikeTheWind crews, and fellow Serpentine RC members. It was also fantastic seeing so many others out there…you know who you are!